Nationalists gather to support local Jews, harassed both by anarchists and by police. Nationalist organizations are joining forces for a demonstration supporting the residents of the South Hevron Hills, after a police action they term as "the last straw" in strained relations between local Jews and state authorities. Popular solidarity displays from all across the country are being organized in support of the Southern Hevron Hills residents, under the rallying cry: “You are not alone!”. As part of these displays, a car convoy will head towards the communities Friday in an attempt to strengthen the resolve of the residents, in view of what the organizer say are "serial assaults being committed against them." The move is spearheaded by the “Women in Green” movement. The group's organizers, Yehudit Katsover and Nadia Matar, explained that they view the convoy as "a necessary statement in face of the combined assaults being directed at the local residents by the Arabs, anarchists, European elements, and lately even the Israel Police, as became evident in the 'Undercover Arabs’ incident in Susiya." Partners in the convoy include the grassroots Samaria Residents Council under Benny Katsover, the Binyamin Residents Council headed by Itzik Shadmi, and Kommemiyut, headed by Yehuda Amrani. Following the sting operation by the police, Benny Katsover wrote a strong letter of protest to the Minister of Public Security Yitzchak Aharonovitch, demanding that the officers who planned the entrapment be dismissed from the police force, and warning that the operation endangered the lives of the policemen. The organizers published a message of support for the residents ahead of the convoy: “We are coming to say to you that you are not alone, pioneering people of the Southern Hevron Hills. The anarchists and the European elements that have an abundance of funds, who come to you every week in an attempt to evict you from our land, will not triumph." 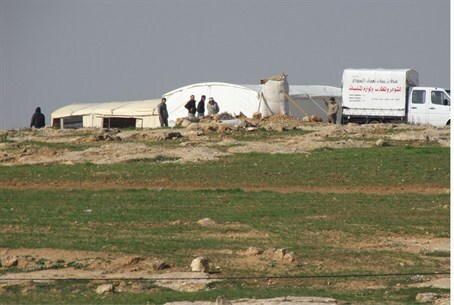 The organizers view the recent Susiya event, in which the police sent officers disguised as Arabs to invade the communities' fields, then detained the residents who came out to protect their community, as "the final straw" in relations with the authorities.